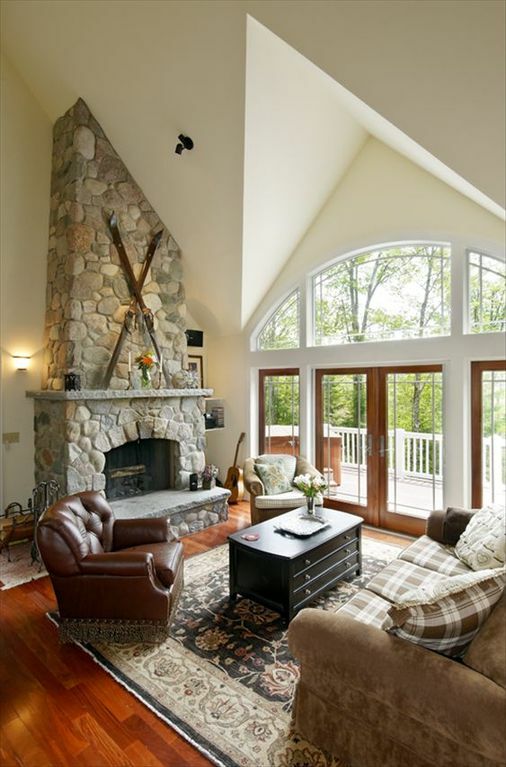 Built in 2006, take in spectacular views of Whiteface Mountain from the cozy screen porch, which features an outdoor fireplace. Or enjoy the Whiteface view from the 6 person Hot Tub on the deck. Additional large stone fireplace in the open living/dining/kitchen area with cathedral ceiling. Bose sound system indoor and out, and great Wi-Fi throughout. Beautiful suede and leather furniture appoints the living area. Gourmet fully-equipped Kitchen with stainless appliances, Jenn-Air grill, and seating at the granite counter tops. Additional Dining area. You'll find a comfy sectional down in the Playroom, which features a large flat-screen TV, Direct TV, and DVD player. Two bedrooms and a full bath complete this level. There is a 2-Car heated garage, with a workbench perfect for skis and bikes. Up in the loft there is a pull-out sofa and additional seating area. King Master Suite on the main floor has another fireplace for heat and ambiance, Tiffany ceiling fan, bathroom with dual sinks, over-sized soaking tub, shower w/seat, and french doors that open to the large deck with gorgeous views of the High Peaks. All linens provided. Wood as well. Originally from the suburbs of New York, I was born in Lake Placid, because I was born in the summer, and Lake Placid has been a summer destination for my family for generations. I lived in Burlington VT for many years, and have been living and working in Boston now for almost a decade (Beacon Hill). I would spend as much time as I possibly could in Lake Placid, as I grew up a huge lake and mountain girl. But, my husband's family has a vacation home on an island off the coast of Maine, so time needs to be split in the summer. And, our winter ski weekends seem harder to come by with a new baby in our lives. Hence the need and desire to share my home with others, and help them enjoy my beloved Lake Placid experience. Daisy Hill Lodge is on a large area of land that has been in my family for generations, and my siblings and I were fortunate enough to be able to build our own vacation homes on the property. I built mine while still single in my 30's, designed to be the perfect getaway for a young growing family, and with the intention of it being my retirement plan. I'm quite glad I did that in '06, because Daisy Hill Lodge is looking much more beautiful than my 401k these days! 4 Stools at Counter, ^ Chairs at Dning Table. Bring Over Red Bench from Foyer to Seat 8 at DIning. We rented Daisy Hill for a post Christmas ski vacation. Therie were 6 of us.This place had enough space to accommodate us comfortably. The place was quite nice with great features such as a beautiful fire place, awesome hot tub, chef’s kitchen, 3 bedrooms, 2 car garage and many other great features. The beds were comfortable and the place was clean. It was a great location because it was a 5 minute drive to the main strip of Lake Placid where we skated on the Olympic Oval and Mirror Lake, ate at restaurants, shopped at the stores and did some wine testing. It is also only 20 minutes to White Face Ski Resort which is a fantastic place to ski. There was also walking trails that you could access from the property. The property was well laid out, had all amenities that you would expect and was very nice. The owners always responded quickly to my inquiries, gave us helpful tips about the area and where quite nice. We had such a wonderful stay at Daisy Hill. The home is beautiful, has everything you could think of or might need. The layout was perfect as we brought my parents and they had their living space, bathroom and bedroom on a separate floor. Our two three year olds had so may toys to play with and books to enjoy reading. The kitchen is fully equipped. Views from every room on the main floor and french doors for inside outside enjoyment. The deck with a large hot tub is a perfect place to relax and enjoy the stunning mountain view. Martha and her family are just wonderful. We so loved getting to know more about the rich history of the property and family. It made for a very special trip. We look forward to to coming back. Great place! Martha was great to work with and very attentive. Views were fantastic, accommodations perfect, so many nice amenities! Thanks Ryan, you were pretty awesome yourself. Hope you can come enjoy Daisy Hill again - with the new hot tub next time! The winter has unique charm but it's an entirely different experience in the summer to consider as well. Daisy Hill is a delight. Beautiful home and great location. loaded with amenities. Lake Placid is a great place to visit! Home is perfect for a family with kids. If the group is adults only, keep in mind that two of the bedrooms are downstairs with one somewhat small bath. One of these has two low twins perfect for kids... not so much for adults. Thanks...You guys were awesome guests! Hope you can make it back next Fall and enjoy a few more sunny days! My husband and I and our young adult children spent a glorious week at Daisy Hill. The kitchen/ great room is perfect for sharing meals and conversation and the view from the deck and hot tub was beautiful - even better than in the pictures. The place was comfortable, clean, perfect for our needs and did not disappoint one bit. Martha and the home caretakers were quite responsive and made sure that the hot tub was ready for us upon arrival. The hiking and kayaking was great, the town with lots of shops and restaurants. We would absolutely stay here again if we find ourselves returning to Lake Placid! Seasonal: fall/spring off-season, summer/winter high-season, special events Low to High is $550-$675 per night.... $2500-$3800 per week One Week Minimum During Holiday Periods, 4 night minimum on holiday weekends. $150 Housekeeping Fee Required of Every Stay - All Linens, Firewood Included Make a long weekend longer during the off-season with a 4th night free!